An entire year has rolled around since Barb of Creative Culinary launched Progressive Eats, and since then, we have had some really fantastic meals! Too bad it’s a virtual progressive dinner and not an actual one, but at least we have everyone’s recipes if we want to recreate the meals at home. In North Carolina, July is the height of summer. The hottest month of the year. And herbs are everywhere, so I was excited to see that Barb chose herbs as the theme this month. I love how creative everyone is with the themes, and this month is no exception. Our amazing Progressive Eats crew has featured so many fresh, fragrant herbs this month, from cilantro to basil to rosemary to fenugreek. You’ll find everything from condiments to drinks to main dishes to desserts as well. I can’t wait any longer. 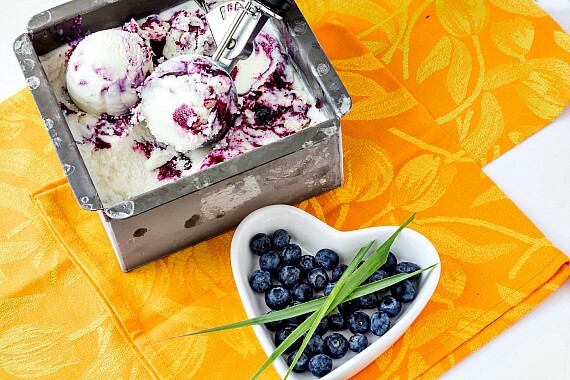 Check out all the deliciousness, and stay tuned after for my offering, Blueberry Lemongrass Ice Cream, for a refreshingly lemony herbal ending to the meal. See? I told you it was an amazing line up! And now, on to my ice cream. A few months ago, I had the pleasure of finally meeting Nancie McDermott in person at her book signing for the release of her updated classic cookbook, Simply Vegetarian Thai Cooking: 125 Real Thai Recipes (affiliate link), at Quail Ridge Books in Raleigh. Nancie is a gracious and genuine ray of sunshine. She loves what she does, and her passion for food and for people simply beams from her. She gave a wonderful talk about her book and about living in Thailand while she was in the Peace Corps. She even brought snacks for everyone to try as well as lemongrass that she had trimmed so it was ready to root and plant. The Beloved and I munched and visited, and once all the other folks had left, we had the Hugging and the Taking of Pictures. We had a wonderful visit, and I love that I now can call Nancie a Friend In Real Life. 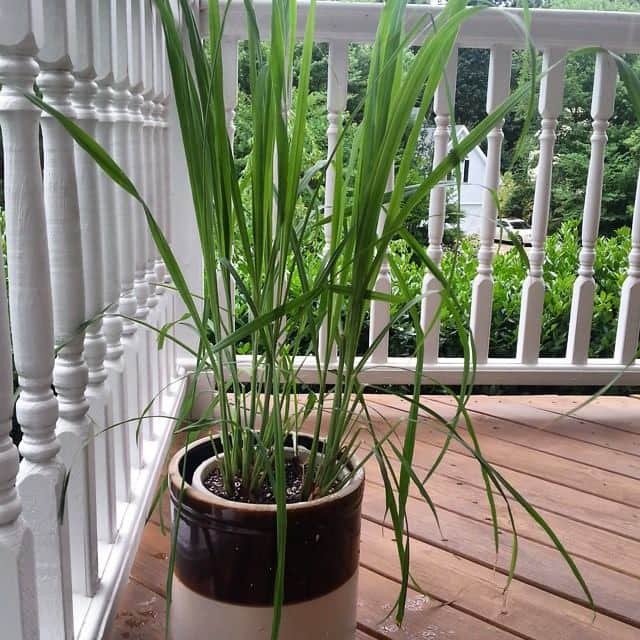 I am notoriously terrible at gardening, but I left with the remaining four lemongrass stalks and dutifully put them in water to root. And root they did. When I learned this months’ theme, cooking with herbs, I knew I wanted to put The Nancies to work, and since Progressive Eats always falls on a Tuesday, it’s a good opportunity for me to kill two birds with one stone and also post an Ice Cream Tuesday. While I don’t always make desserts for Progressive Eats, I really wanted to make some lemongrass ice cream. 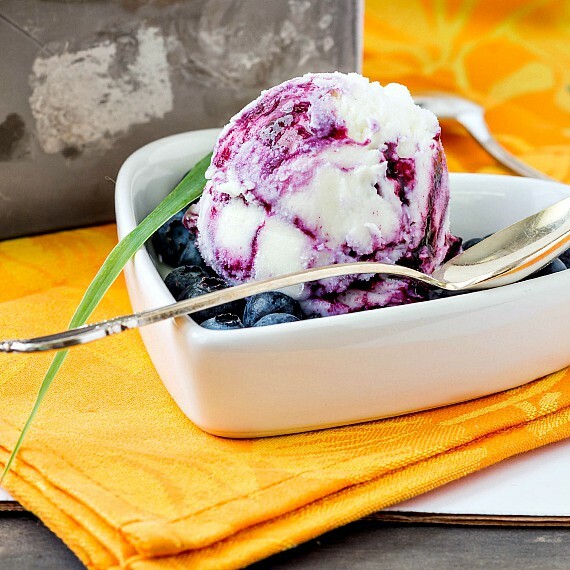 Pairing the lemongrass with blueberry is just a simple twist on the time-honored lemon-blueberry combination, and I brought in some coconut milk as a nod to Thailand, where lemongrass and coconut milk are found together in many curries. The result is mildly coconutty with a bright, herbal lemon note. 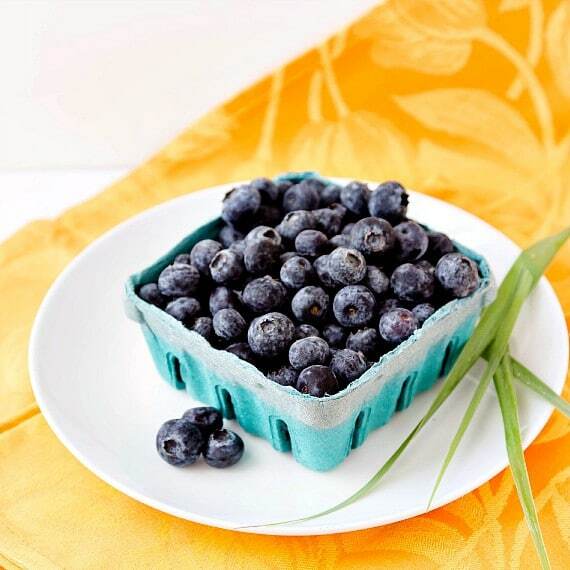 The jam is mellow blueberry balanced with just a hint of lemon juice and lemon zest to tie it all together. 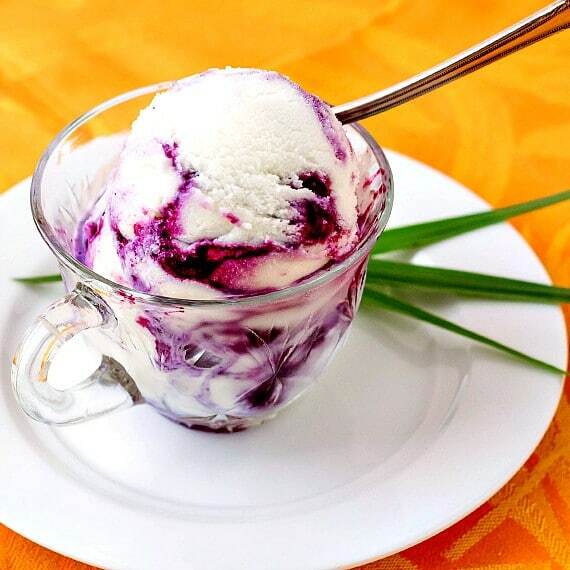 Please note that if you are vegan, you can use all full-fat coconut milk in your base so you can enjoy a lovely vegan version of blueberry lemongrass ice cream. This light, egg-less summer ice cream combines the bright, herbal lemon notes of lemongrass with creamy coconut. 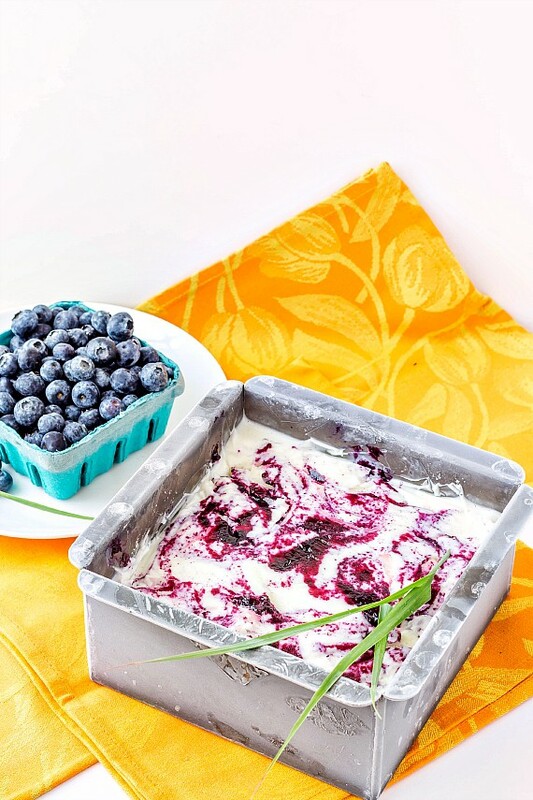 The mellow blueberry swirl marries beautifully with the base. You may have to let the ice cream temper on the counter for a few minutes before scooping. Combine all the ingredients in a heavy bottomed sauce pan. Heat over medium to medium-high heat, stirring frequently at first and then constantly once the mixture begins to steam, until the milks come to a boil and thicken. Boil an additional 15 seconds and remove from the heat. Allow the mixture to sit at room temperature for 45 minutes. Strain the custard into a metal bowl to remove all the lemongrass. Be sure to press down hard on all the solids. Cool and then chill the custard to no more than 40F. Churn according to your manufacturer's instructions. Combine all the ingredients in a heavy-bottomed sauce pan. Heat over low to medium-low heat, stirring frequently, until berries start to burst and release their juices and the sugar dissolves. Continue to cook over medium heat, stirring frequently (and then constantly as the jam begins to thicken) until the mixture reaches 221F. Press the jam through a fine mesh strainer to get rid of seeds and skins. You'll have to press pretty hard and work at it for a bit since the jam is thick. You will end up with about 1/3 cup of jam. Cool and then chill until ready to use. Place your container and jam in the freezer for at least 15 minutes before starting. Once the ice cream is churned to soft-serve state, layer in 1/3 of the base and spread evenly into your container. Spread on 1 1/2 tablespoons of the jam and spread it as evenly as you can. It will be a thin layer. Repeat with more of the base, more of the jam and finish with the remaining base. Dot the last of the jam on top and swirl the layers together with a knife or offset spatula. 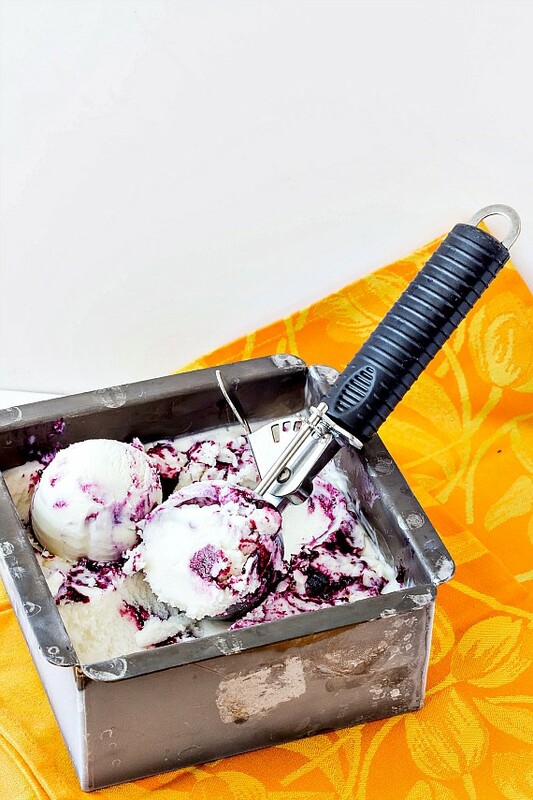 Press plastic directly on the surface of the ice cream and freeze until firm. *To make vegan, leave out the half and half and use 32 oz of full fat coconut milk. I don't recommend using light coconut milk. Welcome to Progressive Eats, our virtual version of a Progressive Dinner Party. 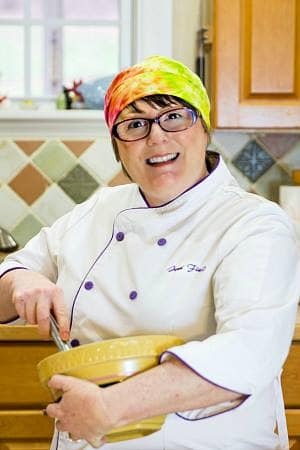 This month’s theme is Cooking with Herbs and is hosted by Progressive Eats founder Barb Kiebel from Creative Culinary. With summer in full swing, it’s time to put all those beautiful herbs to good use in salads, main courses, desserts and drinks! I encourage comments, so as a Conversation Starter, what are your favorite herbs to cook and bake with? I hope you enjoyed this month’s herbal feast as much as I did. Thank you so much for spending some time with me and the rest of the Progressive Eats gang today. Have a lovely day. I love the flavor of lemongrass but typically use it in savory dishes but like other herbs I’m experimenting with (basil is a given) I’m learning how great they can be in sweet concoctions; particularly with fruit. Nice addition to ‘herb’ month Jenni.